As the Jesuit football team made the long, steep climb up the Lake Oswego High School stairs toward the visitor's locker room, the Laker liberty bell chimed for a good 45 seconds, nearly drowning out Travis Spreen as he tried to sum up what had just unfolded minutes before on the field below him. 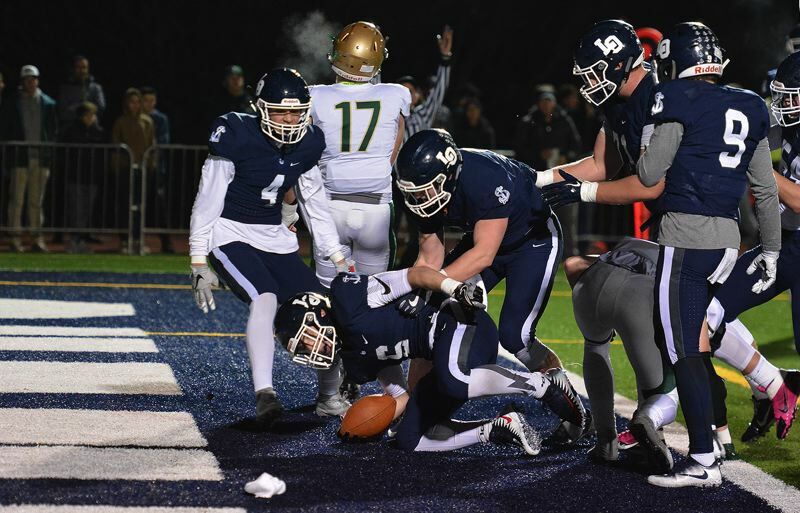 The bell, which rang after every Laker touchdown, dinged and donged back and forth as Spreen reached the top step — a jarring reminder of the avalanche Lake Oswego ignited in the second half of the Class 6A quarterfinals. Trailing Jesuit 17-14 with 4 minutes and 30 seconds to go in the second quarter, the No. 1 Lakers put on what could be described as their best stretch of play this season. Lake Oswego scored 34 unanswered points, shutting out the Crusaders in the final two quarters thanks to six second-half takeaways, and heaped on a handful of touchdowns to eliminate 48-17 at LOHS on Friday. The No. 1 Lakers will play No. 4 South Medford in the 6A semifinals next Friday at Hillsboro Stadium at 5 p.m. It will be Lake Oswego's first time in the semis since 2012. "I'm feeling good, I'm really proud of my team right now," Lake Oswego senior running back Collin Bracken said. "Jesuit is a really tough team and a really good team, so I'm just glad we played our game and showed people what we're capable of." "This feels amazing. I've never been in this position before and I feel on top of the world," Lake Oswego junior defensive back Keenan DeRaeve said. "It's sweet beating Jesuit. We've haven't played them since I think 2012, so it was good to get a crack at them again and it's always good to get a win." 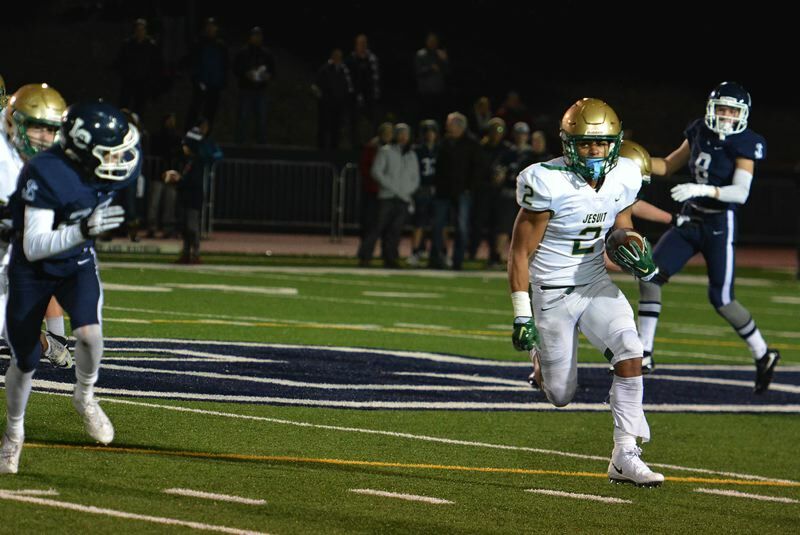 Jesuit's season ended in the quarterfinals for the second consecutive season, but the Crusaders took the Metro League crown for the fifth straight year and won 10 games once again under head coach Ken Potter. "We never gave up," Jesuit senior linebacker Blake Baldocchi said. "We always battled and I'm just thankful for the coaches and everyone on the team. We were a gritty, really feisty bunch. There's a lot of love amongst our guys. It's a great group." Jesuit hadn't lost a game by 30 or more points since '13 when it dropped a 47-17 decision to Camas (WA) in non-league play. The Crusaders, plain and simple, aren't used to suffering such atypical defeats with such stark halves. In the first 24 minutes, Jesuit was its customary punishing self, running the ball at will with star running back Trey Lowe and his vastly improved offensive line. Lowe scored on a 59-yard touchdown jaunt and set up a Will Spitznagel quarterback sneak touchdown with another long sprint down the left sideline that made it 14-14 with 2:33 to go in the second quarter. David Arndorfer made a 30-yard field goal to break up the tie in the second quarter. 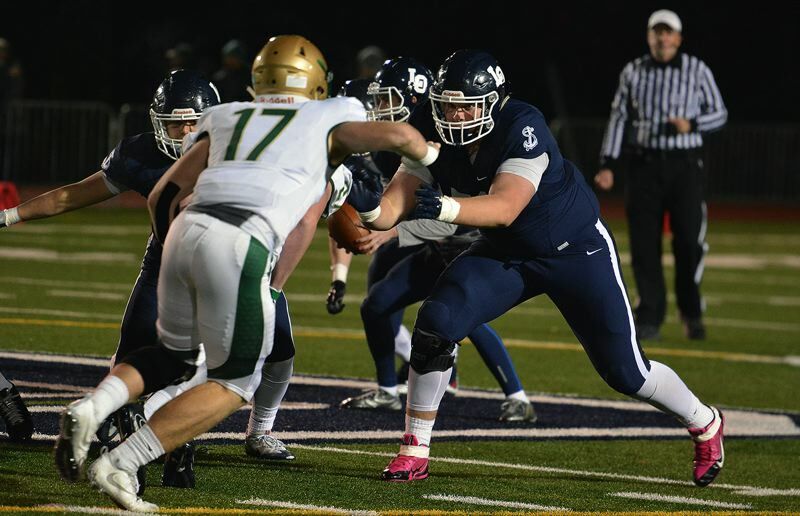 And though Lake Oswego senior quarterback Jake Dukart linked up with Jordan Newlin for a 31-yard touchdown pass just before halftime that gave Lake Oswego a 21-17 advantage, Jesuit was where it needed to be, seemingly. These were two perceived evenly matched teams with equally dangerous personnel. The second half felt like a potential barnburner, a game that boiled down to who had the ball last. Lowe ran for 181 yards in the first half and made it look relatively easy doing so. A four-point hole was one big Lowe run away from vanishing. Then the Crusaders, uncharacteristically, came apart at the seams. On the first possession of the third quarter, Bracken broke a trio of tackles and bolted up the middle for a 20-yard touchdown run to extend the Lakers' lead to 28-17. Two plays later, Lake Oswego safety Bryson Breeze stripped the pigskin out of Lowe's hands and big defensive tackle Dawson Jaramillo fell on it to give the ball back to the Lakers. Dukart linked up with Casey Filkins for a 28-yard pass and Bracken pounded home the ensuing one-yard score to extend Lake Oswego's lead to 34-17 just three minutes and 30 seconds into the third quarter. "Honestly, I can't put my finger on what happened, but you just have to give credit to L.O.," Baldocchi said. "They played a good game and they won. They were able to run, they were able to pass and that's a tough team to beat that did a lot of things well. They get to keep playing and we're going home." Jesuit just couldn't get out of its own way in the second half. Coming into Friday, the Crusaders turned the ball over only 11 times total all season including just one pick. Jesuit threw four interceptions and fumbled the ball twice in the second half alone against Lake Oswego. Two of those picks were quickly flipped into touchdowns by the Laker offense. Turning the ball over is atypical of any Jesuit team. So are 12 penalties for 125 yards. "I don't know how to explain it, we just had a breakdown," Jesuit junior lineman Joe Quillin said. "It happens to some teams, but it shouldn't have happened to us. This is not the way we wanted it to end. But we love our seniors and we'll be back next year." Applaud Lake Oswego, however. The Laker defense completely dialed in on Lowe, holding him to just four rushing yards in the second half. They were entirely content with letting the rest of the Crusaders beat them, capitalized on playing with the lead in the final two quarters and came up with huge takeaways in opportune times. "I'm proud of my team, I just think we shot ourselves in the foot this game," Jesuit left tackle Travis Spreen said. "Lake Oswego got us on a bad night, but kudos to them. Turnovers just killed us, that's it." Momentum is hard to define. It can't really be quantified. It doesn't show up in the box score, it's not an official stat. 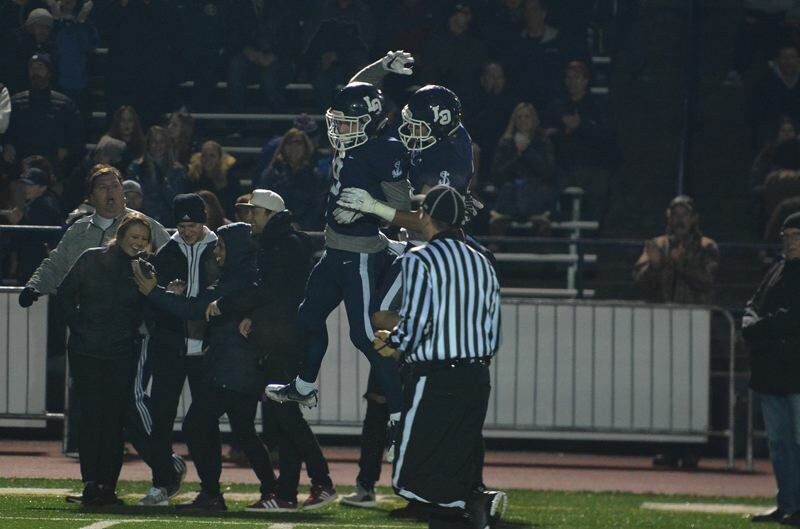 But clearly, somewhere along the way, perhaps when Newlin came down with the Dukart dime just before the half or when Bracken barreled into the end zone to begin the third, the game's energy shifted entirely toward Lake Oswego. Those takeaways-into-touchdowns death knells that knock out opponents in a matter of minutes are something Jesuit normally specializes in. The Crusaders have taken many a team's will with such tide shifts. To have the tables turned by a Laker team that relished every minute of the unraveling, so quickly and so dramatically was unknown territory. "The ball started to bounce (LO's) way and they made plays and we didn't — that's what it comes down to," Baldocchi said. "You have to give them credit because they played a hell of a game. It was different. We're not used to that, but it's a good life lesson." 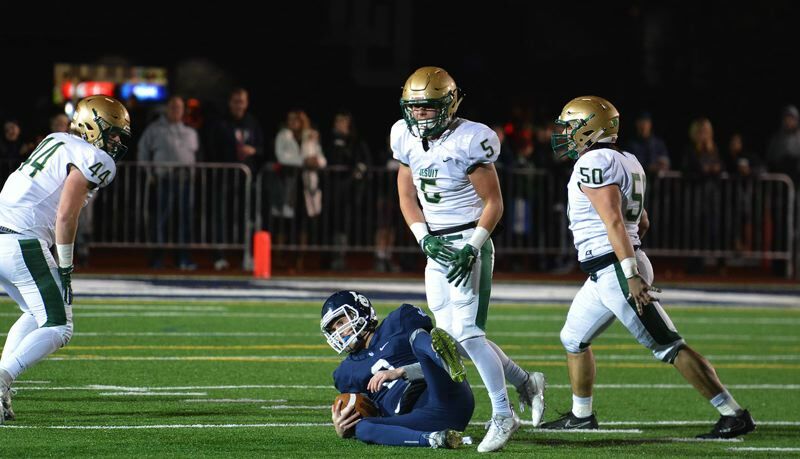 When Lake Oswego's lead swelled to double digits, Jesuit was forced to abandon its normally gashing run game and split Lowe out wide as a receiver. Knowing the Metro League MVP is a threat to take it the distance from anywhere on the field, the Lakers threw two, sometimes three defensive backs at the University of Washington commit and dropped extra defenders into coverage elsewhere around the defense. With 58 seconds left in the third quarter, DeRaeve shadowed Lowe and picked off the across the field heave from Will Spitznagel along the right sideline. And on the first play of the fourth quarter, Lake Oswego running back Alex Bassett bolted 46 yards to paydirt to make it 41-17. "It's great to win and all of our hard work paid off," Jaramillo said. "We prepared all week for them to throw everything at us and we knew it would be a smash-mouth game. It was physical and we prepared for that, and it paid off." Lake Oswego defensive lineman Mike Mercep nabbed a screen pass in the middle of the field and Dukart flipped that turnover into a 23-yard touchdown lob to 6-foot-7 Kameron Harvey. The Lakers later pounced on a fumble around midfield. And junior free safety Henry McNish came up with Lake Oswego's final takeaway of the game on a diving interception. Jesuit isn't going anywhere on the state scene. The junior class is stocked with all-league caliber talent. Sophomores with vast potential such as Andy Alfieri should be back to try and build on what Lowe, Spreen and this star-studded senior class helped construct. This kind of loss will sting for a while, but next season is just around the corner. "I really love all my teammates," Quillin said. "The season didn't end the way we wanted it to...but we're going to be back next year. All of the juniors are going to be back at it starting Monday. We're going to be back and better than ever."